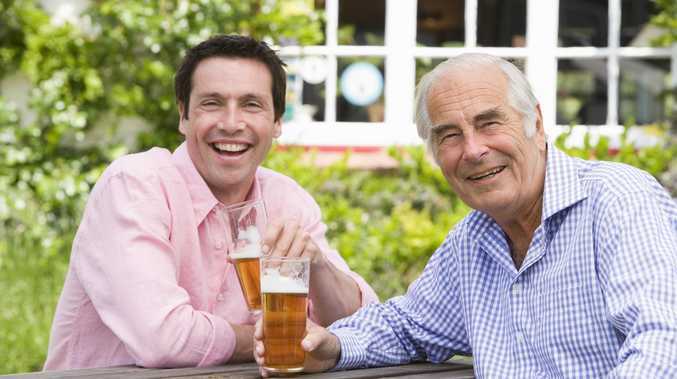 AS WE approach one of the most important days of the year, it is appropriate we take time to ponder one of the really big questions of life - is alcohol a suitable gift for Father's Day? Yes, Gentle Reader, in the blink of an eye another year has passed, and dutiful offspring everywhere are faced with the conundrum of what to get Dad. Father's Day has always seemed to be a pretty poor second to Mother's Day in the commercial fuss department - sure you have a few extra catalogues fall out of the newspaper or maybe the letterbox, but there is nowhere near the frenzy of activity associated with Mother's Day. Admittedly, when I have brought this topic up at Chez Irwin, the response has always been something along the lines of "Every day is Father's Day" or, "Why would I care, you are not my father?" and little more, so it may be worthwhile exercising some caution exploring this discrepancy in a domestic setting. Whether or not to purchase bottles of something can be a curly one though. Most dads probably don't wait until a September Sunday to be given a carton of laughing fluid, so do you run the risk and buy some exotic that he may not like, or get a box of his regular drop and stand accused of the drinking equivalent of socks and undies. Just by the by, I really appreciate socks and undies for presents, they are really useful and you will get around to using them, as contrast to a plastic donkey where a cigarette comes out of its bottom when you press the head. So my suggestion is to look at what drink Dad enjoys and go one step further up the scale. So, if he likes Gold, get a carton of Gold Pale Ale. If full-strength XXXX is his poison of choice, make it a James Squire Chancer. And if he is a regular imbiber of the Squire range, find a six-pack of something like Feral War Hog IPA. This shows you have put enough work in to know what he likes, and have given him the chance to experience something a bit special. Don't feel obliged to go for the full 24 though, just in case he thinks it tastes foul and should be put back in the camel. In fact, from Hugh the Neighbour and me, if any of our children are reading this, the James Squire Chancer will do quite nicely, thank you very much.